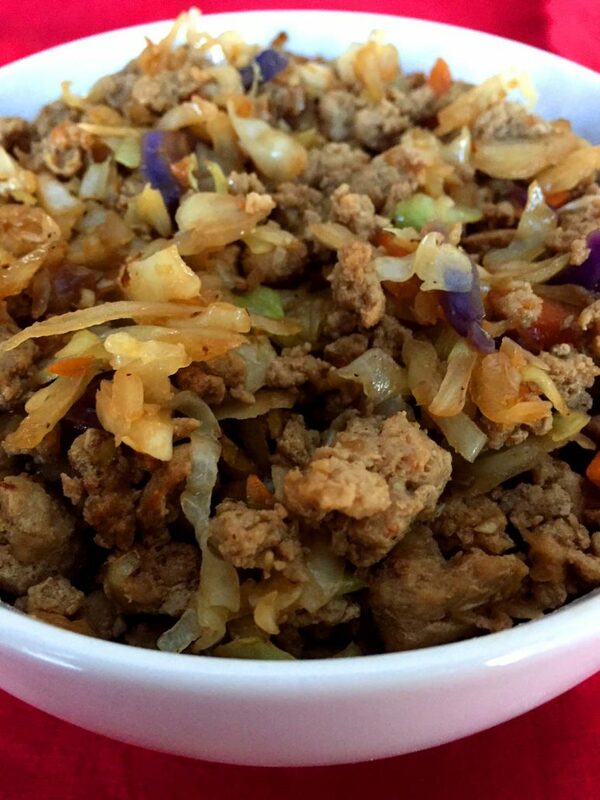 Instant Pot egg roll in a bowl is your perfect healthy low-carb dinner! Ready in 10 minutes from start to finish! 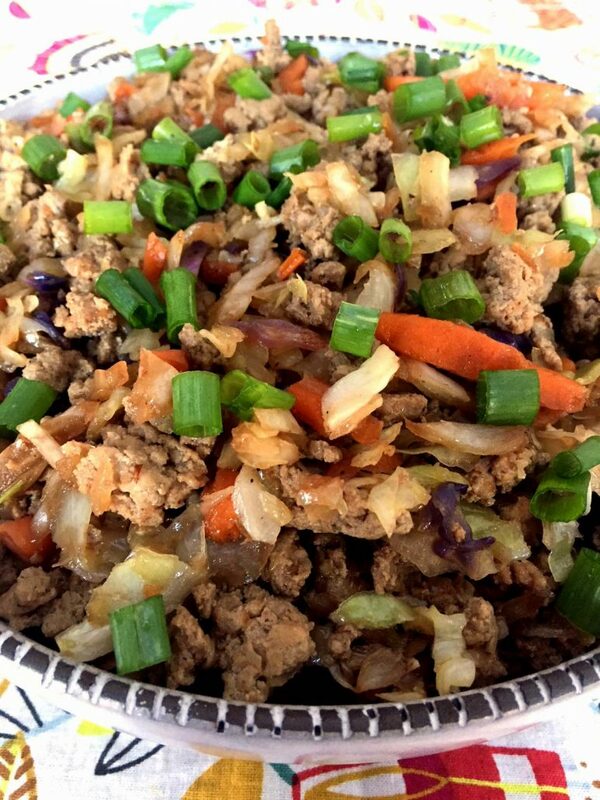 “Egg roll in a bowl” tastes like the egg roll without a wrapper 🙂 If you can’t get enough of the egg roll filling and want to eat it with a spoon, this will surely satisfy your craving! If you are looking for classic egg rolls in wrappers, check out my easy authentic egg roll recipe. 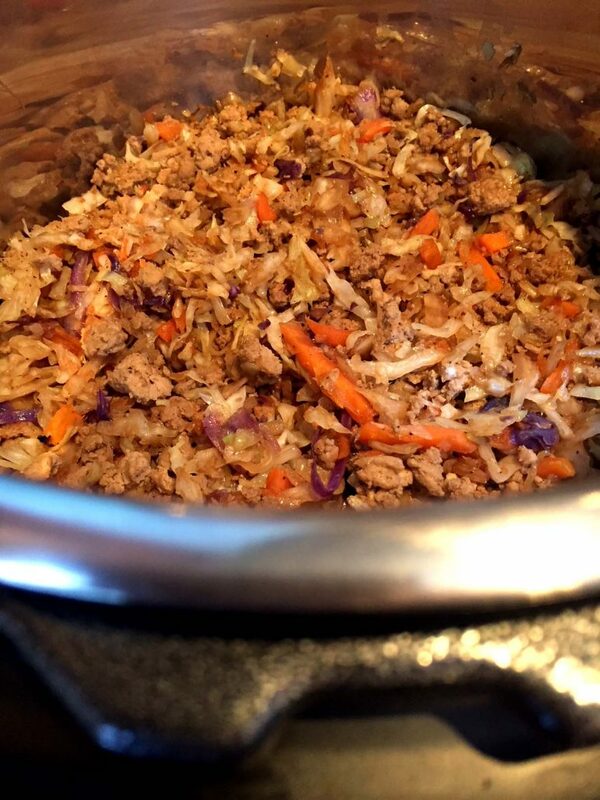 Instant Pot surely makes life easier 🙂 This egg roll in a bowl dinner is ready in 10 minutes from start to finish thanks to amazing Instant Pot! So easy and yummy! No Instant Pot? No problem! 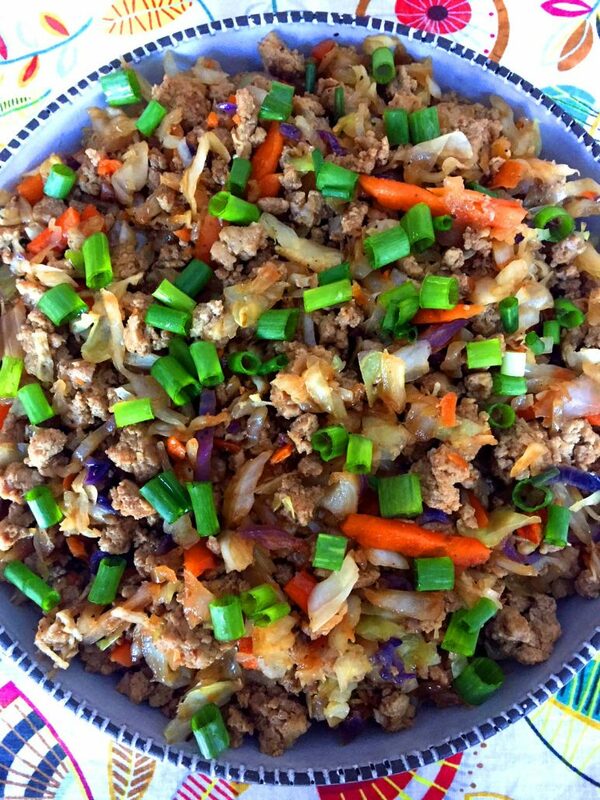 For a stovetop version of this recipe, see my classic easy eggroll in a bowl. Enjoy! 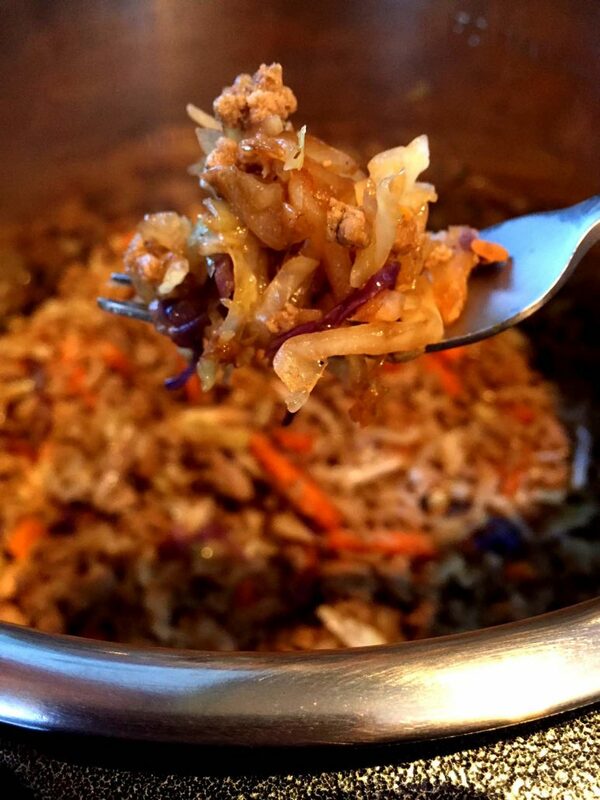 If you are cutting carbs from your diet, this Instant Pot egg roll in a bowl recipe is a dream come true! It’s a complete meal that consists of meat and vegetables – and it’s so yummy that you won’t miss the carbs! Perfect for any low-carb diet including keto! 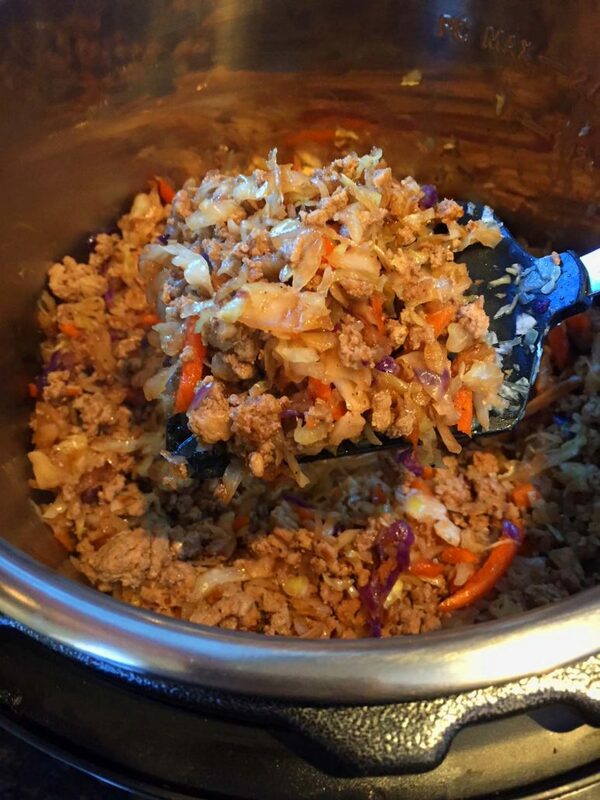 Egg roll in a bowl is made with very simple ingredients – ground pork or chicken, coleslaw mix (shredded cabbage and carrots), chicken stock, soy sauce, minced garlic and ground ginger. Simple ingredients produce a delicious one-pot meal, made super easy in your Instant Pot! 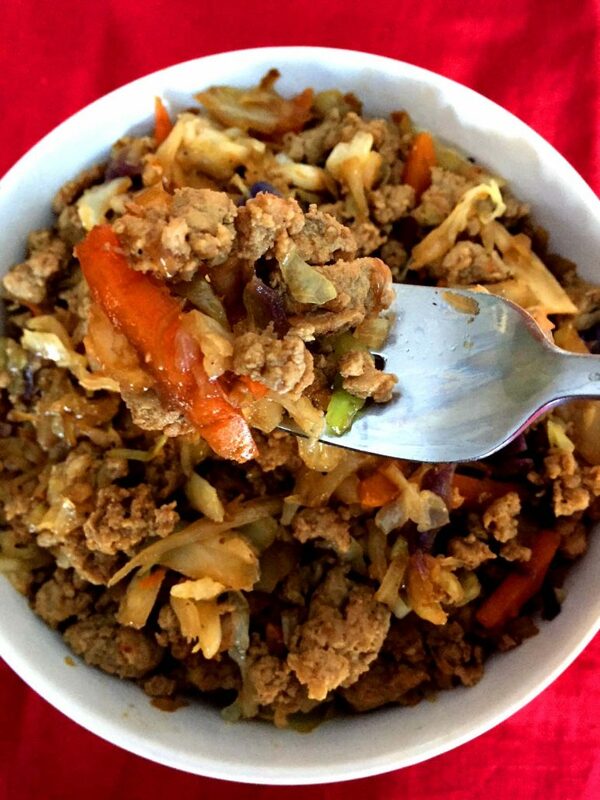 Making egg roll in a bowl is super easy. First use the Saute function of the Instant Pot to cook the ground meat, then add the coleslaw mix, chicken stock, soy sauce, minced garlic and ground ginger. Close the lid of the Instant Pot and use the “Pressure Cook” function with the time set to ZERO minutes. When it beeps, do the quick release (QR) of the steam, transfer to bowls and serve. Coleslaw mix cooks really quickly and zero minutes is enough (it still takes several minutes for the Instant Pot to come to pressure before the timer countdown and that’s when it will cook). 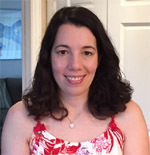 In fact, I use the “zero minute” technique for cooking many vegetables in the Instant Pot, such as Instant Pot green beans, cauliflower and broccoli. 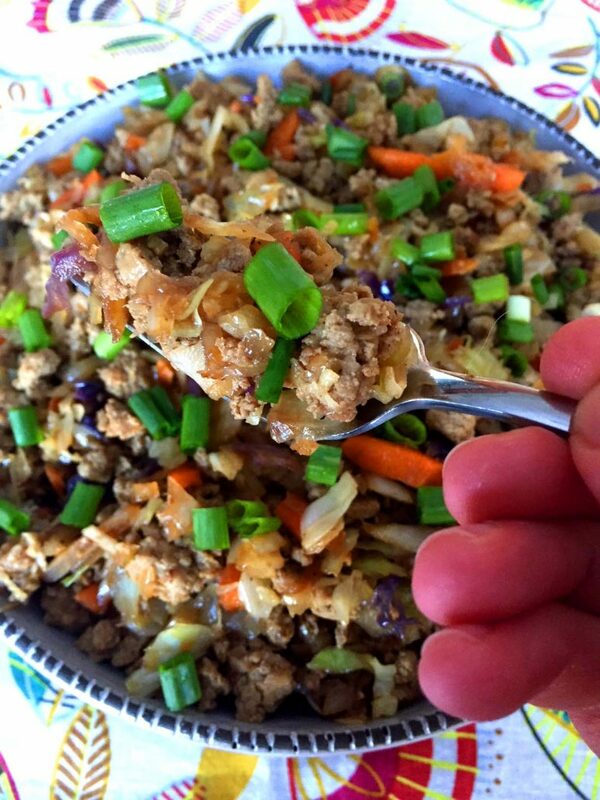 Egg roll in a bowl is delicious topped with the fresh chopped green onions! A 10-minute recipe that’s a one-pot meal and happens to be healthy – you owe it to yourself to add this to your “make this week” recipe list right now! 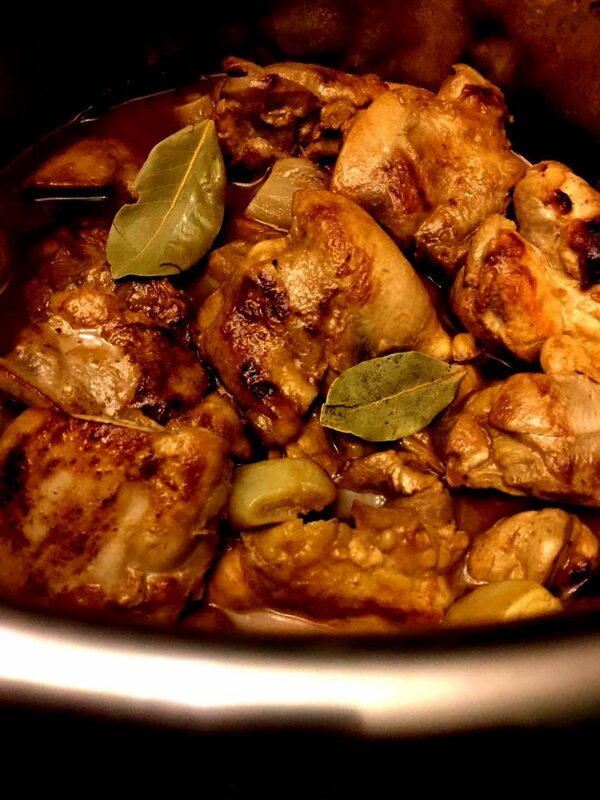 Instant Pot Adobo Chicken – this authentic Filipino dish is also low-carb and healthy and super flavorful! So easy to make in your Instant Pot! Instant Pot Honey Mustard Chicken – so easy to make with finger-lickin’ honey-mustard sauce! Instant Pot Broccoli – cook veggies to perfection in your Instant Pot! So healthy and yummy! Instant Pot Drumsticks – got a package of frozen chicken legs in the freezer? 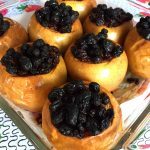 Make this recipe! Instant Pot Applesauce – so easy to make and flavorful, no added sugar – amazing! 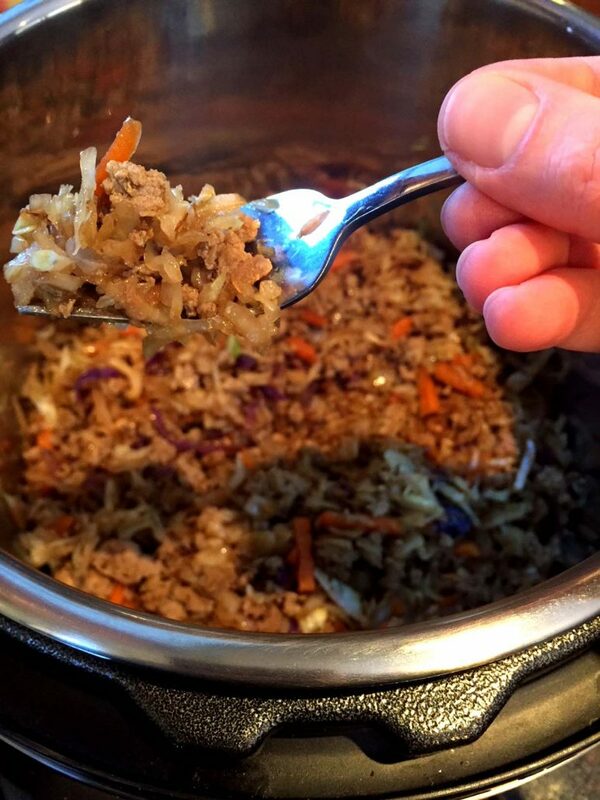 Instant Pot "egg roll in a bowl" is a perfect low-carb dinner! 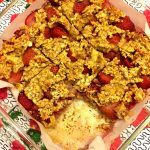 It tastes like egg roll without a wrapper 🙂 So easy, healthy and delicious! In a cup, mix chicken stock, soy sauce, minced garlic, ground ginger and sesame oil and set aside. Open the lid of the Instant Pot and set the Instant Pot to a Saute setting. Add ground meat and cook, stirring occasionally, for 5 minutes, or until cooked through. Close the Instant Pot lid, select "Pressure Cook" or "Manual" option and set the time to zero minutes (zero minutes pressure cooking is enough time to cook the cabbage, the cooking will be done while the Instant Pot is coming to pressure). When the timer beeps, do a quick release (QR) of the steam, open the Instant Pot and mix everything to combine. Transfer to serving bowls and top with chopped green onions if desired. This was an easy to follow receipe. I changed the ground chicken to thinly sliced chicken breast as I don’t like ground chicken. I used about 3T of sesame oil to saute it. I put the garlic in with the chicken. I found it a little bland- maybe next time I will add some ref pepper flakes. But it was super easy and quick. I loved using the cole slaw. At first, I wondered why I would make this in the IP when it’s already a very simple stove top recipe. But we’ve been above 100 degrees for about 25 days this summer already here in DFW, and I find myself dreading to fire up the stove. So I’ve made this in the IP twice already due to the heat. It’s really good. The first time I used Trader Joe’s Healthy 8 chopped veggie mix and the second time a bag of broccoli slaw, with ground pork both times. I also add a touch of brown sugar to the soy sauce and stock mixture. I don’t think I’ll ever make it on the stove top again. It would work if it’s broccoli slaw instead of cole slaw mix, but wouldn’t work with broccoli florets. If you dump whole broccoli florets in there, they’ll get mushy. So if you want to use broccoli, shred it in the food processor to resemble cole slaw mix and use in recipe instead of cole slaw. If you want to use whole broccoli florets, cook them in the microwave and then stir it into the finished dish at the end. 1/2 cup of liquid is enough for the 6qt Instant Pot. Cabbage also releases some water as well. Question. Just got my 6 quart IP LUX6 last week. How do I set the cooking time to 0? Press the “Pressure Cook” button, and then keep pressing the button with the minus sign until the cook time is 0. This was fantastic! The flavors were spot on. Even my picky-doesn’t eat any thing with “salad” type stuff in it LOVED it! We decided it needed more veggies, so next time I will double the bag of coleslaw (I used a large bag to begin with). Thanks for sharing! If I want to double the recipe do I need to adjust the cook time? How would i alter this for the 8 qt IP? Add an extra 1/4 cup water to liquids. This was really good. I think I may add a bit more slaw next time. But this was delicious. Thank you.